There are several types of clouds in the atmosphere and one of them is altocumulus castellanus clouds. How does it look like and what kind of weather it brings? Read on to learn more. Altocumulus castellanus is classified under altocumulus clouds. This cloud species is named for its tower-like structure that develops from the main cloud deck akin to prehistoric castles. The dynamic towers of altocumulus castellanus clouds indicate unstable air at mid-atmospheric level due to an upcoming storm. At What Height are Altocumulus Castellanus clouds Found? Altocumulus castellanus appear anywhere between 2,000 and 6,000 meters (or 6,500 to 20,000 feet) above the Earth’s surface. Though they may not be as impressive as other type of clouds, their presence is indicative of an unstable middle atmosphere which could likely result to heavy showers. They can also bring light rain and snow showers when formed at higher regions as a result of the accumulation of moisture in the atmosphere. Altocumulus castellanus clouds form due to the atmospheric convection at mid-level clouds. This occurs due to air instability resulting from the slow rising of warm damp air coming from cold frontal system. Subsequently, billowing tops start to form from the main deck and condensation within air pockets result to the castellanus effect. With further vertical development, altocumulus castellanus cloud could descend into thunderstorm-producing cumulonimbus clouds. Although its formation does not pose danger to the safety of aircrafts traveling through the atmosphere, pilots will experience turbulence from slight to moderate. These cloud formations have wide and large bases where billowing tops extend and appear puffy and feathery. The vertical protrusion of altocumulus castellanus is very apparent when viewed from the side. However, it rapidly develops with solar heating resulting to thundershowers later in the day. Altocumulus castellanus perlucidus is a variety of altocumulus castellanus clouds. It is characterized by dense altocumulus clouds with semi-transparent breaks. 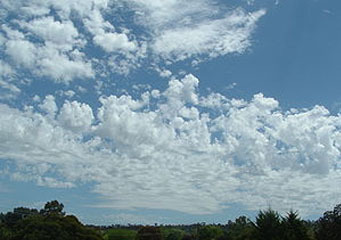 Altocumulus castellanus clouds are seen worldwide. Whenever there is an advancing frontal system, altocumulus castellanus clouds appear due to strong air current happening in the middle level clouds. The beautiful fluffy appearance of altocumulus castellanus clouds belie the strong commotion happening at mid-atmosphere. Whenever this type of cloud emerges, you can expect heavy showers in later in the day as it can metamorphose into the storm cloud, cumulonimbus.